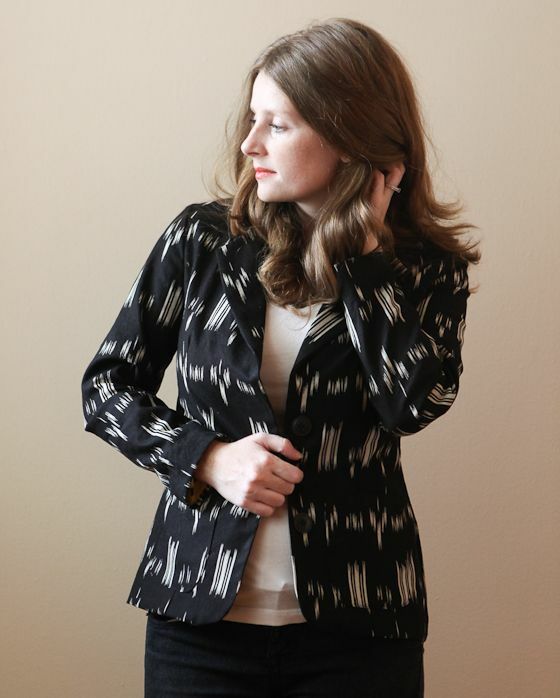 I finished my first item from my garment district fabric excursion a little over a week ago. Since I have already made this blazer once before, it went pretty quickly and I didn’t have to do any fitting. I did decide to do a lining in this one. Since the original didn’t have a lining I used Grainline’s tutorials to draft a lining and then to bag the lining. Awesome tutorials. It went great and I am super excited about how professional this one turned out. Yes, it does look very professional. Great job! I love it and the fabric is beautiful. thanks anto. im pretty excited about it myself. thank you. i was pretty excited with the fabric as well. it was a lucky find. yes, now if it would just get cooler so i could wear it! Damn girl! You are a fast seamstress. This jacket is killer. The lining detail with its pop of color is amazing. Bravo AND a standing ovation! wow, thanks so much madalynne. i often get tunnel vision when i am sewing something that i am really excited about. Wow that was fast! I haven’t even taken my fabric out of the bag. That looks awesome! As a side note, do you have any recommendations for cool maternity patterns? I think I’m going to make a few items for my friend but the ones I’ve seen are kind of boring. i have been so excited about my fabric finds that i just couldn’t wait. 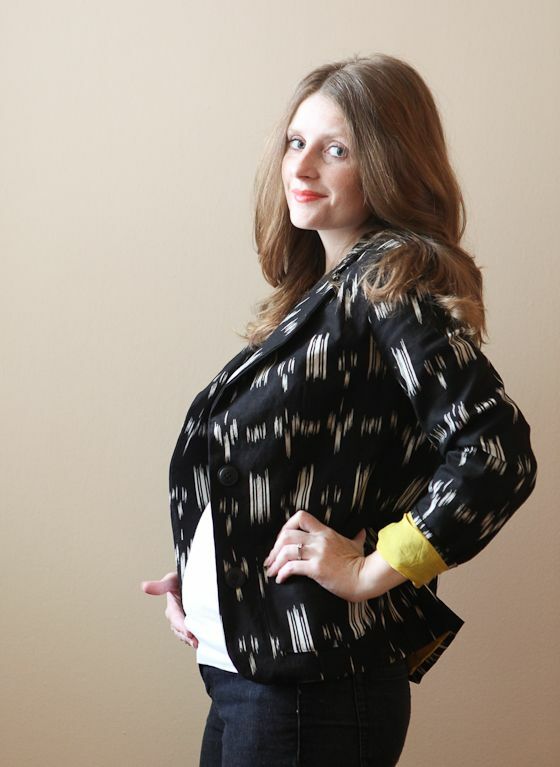 as for maternity patterns, i am a big fan of megan neilsens patterns. there really arnt any others that i recommend. luckily there are a lot of patterns out right now that are not maternity but could work for it. thanks wendy. its one of those colors that i think would be hard for me to wear, but i LOVE it as a lining. It looks beautiful! I love the yellow lining! thanks janice. that yellow lining was a lucky find. thanks for accompanying me to mood so i could find it! Oh dude, this turned out AMAZING!!! Love the print with the lining color so much, way to go! Glad you found the tutorials helpful also. You’ve inspired me to pick my blazer back up, thanks! thanks jen, i can’t wait to see your blazer. i love wearing blazers and can’t wait for it to cool down so i can wear it all of the time. and thanks so much for those tutorials. its so generous of you. Love this! love the fabric choice and the awesome lining! what kind of fabric did you use for the lining? is that crisp fold line just from pressing or did you use so other method to create such a nice fold? thanks kessem. i think the lining is a rayon lining. i got it from mood fabrics. and i did do some understitching around the side and bottom, but the creases as the collar are just from pressing. Love it. And your hair too! Congrats on baby #2.
thanks leslie, i decided two days ago that i wanted to change my part to the middle. sometimes you just need a change. Love the jacket – the yellow lining sets it off perfectly. I love this! What great fabric combos and such a beautifully fitting blazer. Winner! Thanks Jillian! I am pretty excited about it. Wow I can see why you love it so much. It looks so professional and great fabric combo. Awesome job. Thanks Jacinta, can’t wait to wear it outside for the first time. 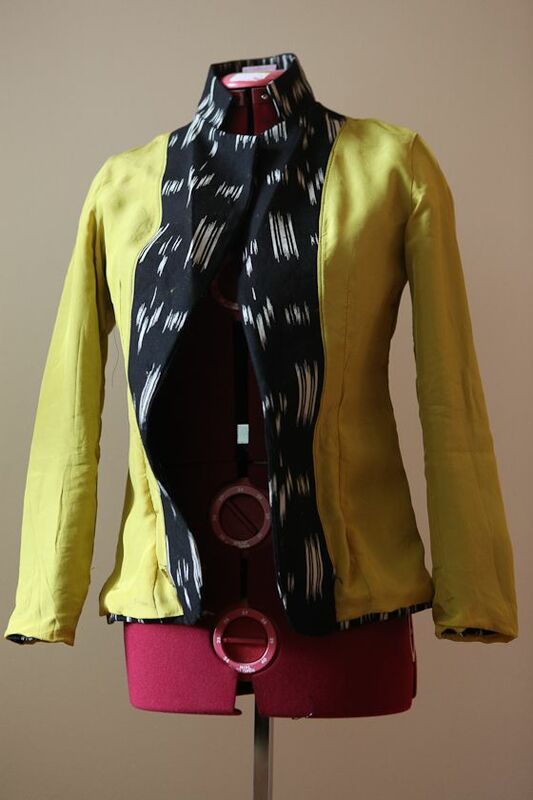 I really love the fabric and the lining colours together – it’s a gorgeous jacket. Especially when you fold the sleeve cuffs up 🙂 You’re looking gorgeous! i like it best with the sleeves up too. its fun to show off the pop of yellow. Oh wow, it’s fabulous! And you look absolutely amazing. Gorgeous work. thank you. it was a lucky fabric find. hopefully i will have lots more lucky finds now that i live near the garment district. Ah this is amazing!! So chic and you look so beautiful! I’m glad to hear you used grainlines tutorials – I thought those were brilliant myself and its good to hear you got such pro results. thanks sallie, those tutorials really were great. i hope to use them again with my aztec blazer too. oooh, this is so awesome! great fabric choices. i’ve been seeing blazers on blogs lately and it’s gotten me in the mood to make one myself. you’ve inspired me! i’m jealous of your garment district access now! thanks dixie, you should definitely make a blazer. i would love to see what you come up with. Wow, this looks great! And I love the photo with your daughter. 🙂 I’m hoping to put a blazer on my project list this fall/winter. Try a blazer for sure. And yes, my daughter likes to sneek into my photos sometimes. This time I decided to just go with it. 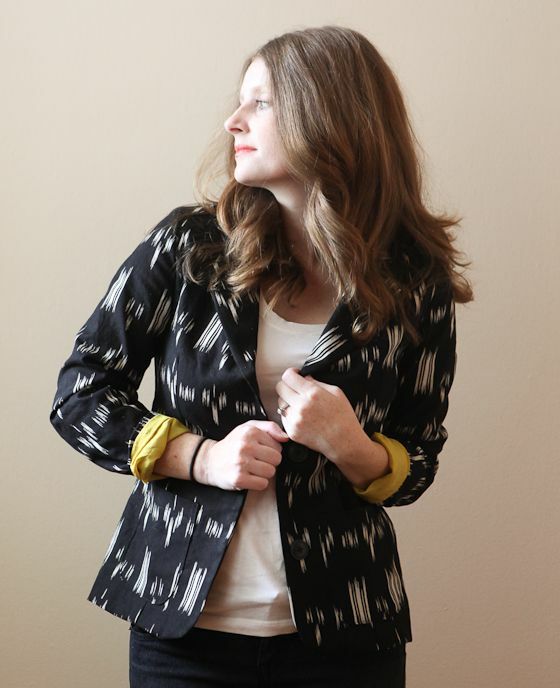 Your blazer looks amazing on you, I love the fabric design and the POP of lime! This looks great and super professional. Love the contrast of lining and patterned linen. lovely blazer ! thanks for sharing the links. What material have you used ? my first visit to your blog.. Hope you will find time to visit mine too . Have a nice day. This looks amazing! I can’t believe how quickly you put this together! The yellow lining is a great detail! This looks even better than I imagined!! Great job and you look fabulous in it! LOVE, LOVE, LOVE!! Wow this jacket came out great! What pattern did you use? Or did you make your own pattern? I love the pop of color! I can’t belive how fast you made it! And it is gorgeous!!! Amazing!!!! I LOVE that print! And the bright lining is just awesome!